but there are some fatal flaws of lithium bromide system. 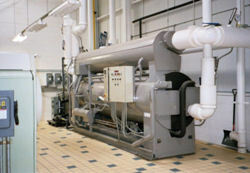 (1) Chiller runs in a vacuum environment, air break in easily. Experiments show that even a little of air of leakage were also bring down the performance. therefore strict sealed chiller of vacuum environment is requested , which increase the unit the manufacture and use of difficulties. (2) Lithium bromide solution on carbon steel has strong corrosion, If there were with air, maintain not well, will cause severe corrosion inside the unit, corrosion can block the nozzle of unit, which means not only bring down the performance, and shorten the life of the unit. (3) If lithium bromide solution were too strong or temperature too low, are easy to become crystal, so the lithium bromide absorption refrigeration has a lot of protection to prevent crystallization, due to temperature drop, if the sudden loss of power in running, could manually open the valve to prevent crystallization, but increase the trouble and risk of operator. 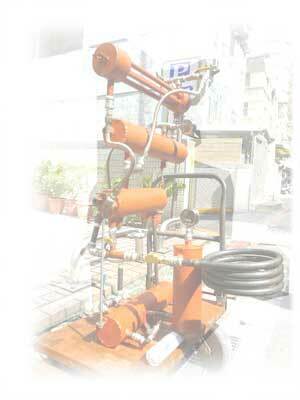 The foundry gases are at 150℃. They cannot be directly used in Ammonia absorption as they contain corrosive gases (SO2 / CO2), suspended solids and moisture that can condense and corrode the heat exchangers. Generally these gases are not cooled below 120℃ due to "dew point corrosion" caused by deposition of sulfur. 1,320 m3/min x 0.87 kg/m3 x 0.24 Kcal/kg.℃ x 60 x (150℃ - 120℃) = 496,000 Kcal/h x 10 hours per day = 4,960,000 Kcals/day. This heat has to be fed to ammonia absorption continuously, over a period of 24 hours. Refrigeration that is possible = 206,600 / 5,500 = 37 TR.